The FDA approved the expanded use of the LAP-BAND® adjustable gastric banding system for obese adults. Obese adults with a BMI of 30-40 with at least one obesity related comorbid condition now qualify for LAP-BAND® System procedure when all other conservative weight-loss therapies have failed. Similar to a belt, the band is placed around the upper part of the stomach. The band signals a sensation of fullness with small portions of food. Similar to the “sleeve,” the LAP-BAND® is a “restrictive” procedure. The digestive process remains unchanged because there is not a change in the placement of the intestine. 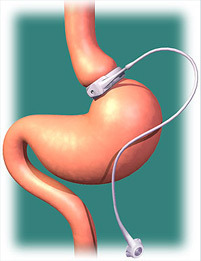 The gastric band is connected to the “port” device which can be tightened periodically. This maintains appetite control land weight loss 1 year after surgery is approximately 40-50 percent. You may obtain additional information at www.lapband.com or www.obesityhelp.com. 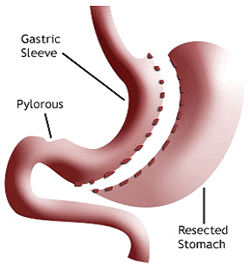 The “sleeve” surgery removes a large portion of the stomach leaving a banana or sleeve-shaped stomach. Known as a “restrictive procedure,” only a small portion of nutritious food can be eaten in each meal. Reduction in portion size promotes weight loss and improvement in medical problems. Average excess weight loss 1 year after surgery is approximately 70-80 percent. 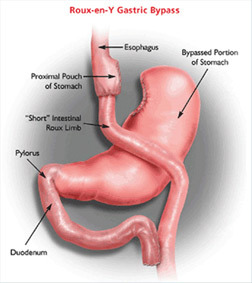 Gastric bypass surgery involves the creation of a small stomach pouch (about the size of a person’s thumb). The small stomach pouch restricts food intake by allowing only a small amount of food to be eaten at one time. In addition, part of the small intestine is rerouted to promote “malabsorption.” This alters the digestive process, partially reducing the absorption of nutrients. “Restriction” and “malabsorption” work together to promote weight reduction and improvement in health. 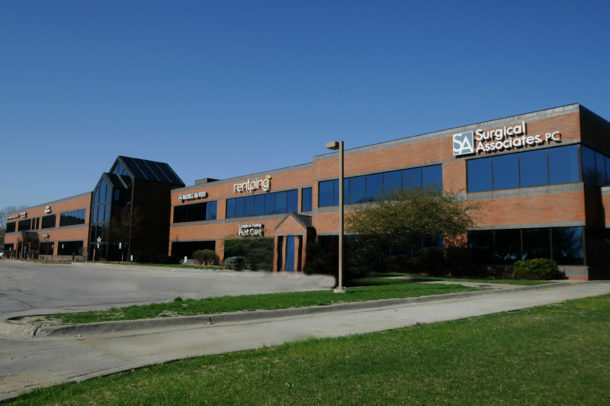 Average excess weight loss 1 year after surgery is approximately 75-85 percent. You may obtain additional information at www.obesityhelp.com.